For many people, the use of astrology by politicians came to light in our era when we learned that U.S. President Ronald Reagan and his wife Nancy planned many of their activities based upon the advice of an astrologer. But, astrology has long been on the mind of the world's great leaders. Certain sources think that Alexander the Great used astrology to help guide his military campaigns and perhaps even spread the word of astrology throughout Greece and Rome. In fact, some believe that Alexander the Great's father was Egyptian Pharaoh Nectanebo. Nectanebo as well known for his belief in astrological and is believed to have told Alexander's mother to wait until the perfect time to give birth to Alexander to help ensure his place in history. It is thought, though incorrectly, that Titus Vestricius Spurinna, who warned Julius Caesar to "Beware of the Ides of March", was an astrologer. Actually, Spurinna was a haruspex. This is also a form of divination, like astrology, but involves looking at the innards of animals, especially those of sacrificed sheep, to foretell the future. Caesar himself did not believe in astrology, but his successor, Augustus, did. He had coins printed with his astrological sign (Capricorn) on them, but had little involvement with astrologers for fear of public ridicule. 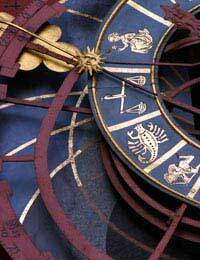 Tiberius, Augustus's successor, knew how to interpret horoscopes and kept Thrasyllus, an astrologer, as his advisor. Tiberius' successor, Claudius, kept Thrasyllus's son, Balbillus, as his astrologer/advisor. John Dee was a 16th century British mathematician, astronomer, geographer, and astrologer. He was commissioned to cast the horoscopes of both Queen Mary (Bloody Mary as she was often known) and her prospective groom, Prince Philip of Spain. However, when he created a horoscope for Queen Mary's half-sister, Princess Elizabeth, Dee was briefly imprisoned in 1555 for witchcraft and sorcery. He formed a friendship with Elizabeth and once she took the throne (thus becoming Queen Elizabeth I); he became her trusted astrological advisor. He even chose the date of her coronation. Many people wondered how he gained Elizabeth's trust and earned such an honored position so quickly after she took the throne. However, some scholars have suggested that Dee acted as Princess Elizabeth's spy during Mary's administration. Americans might be surprised to find that many researchers think our founding fathers had strong beliefs in astrology. Books such as "Turning the Solomon Key: George Washington, the Bright Morning Star, and the Secrets of Masonic Astrology" by Robert Lomas tries to link early American leaders who were Freemasons, such as George Washington and statesman Benjamin Franklin, to astrology. Now whether the founding fathers believed in astrology or not may never be known, but there are several astrological images located in government buildings around Washington, D.C. For example, the Ariel Rios Federal Building, part of the Federal Triangle government complex, has a ceiling mural that contains images the four seasons and the twelve zodiac signs. David Ovason's book, "The Secret Architecture of Our Nation's Capital" points out that the National Academy of Sciences is a statue of Einstein gazing at a horoscope. The south entrance hall door of the Academy has twelve zodiac characters on it as well. All in all, Ovason found 23 zodiac symbols in government buildings around Washington, D.C. Ovason also goes on to show that the Federal Triangle itself (The Washington Monument, White House, and Capital Building) is aligned with the three main stars of the Virgo constellation. In the 1980s, Americans found out for a fact that astrology was helping plan the movements of their president. Many Christians supported Ronald Reagan's campaign for president and were dismayed when they found out that First Lady Nancy Reagan often consulted astrologer Joan Quigley for advice. Nancy had known Joan Quigley since the 1970s, but Nancy sought her advice for the president's personal safety after the assignation attempt on his life in 1981. In "For the Record" by former White House Chief of Staff Donald Regan, he states that Nancy Reagan used astrologers to help plan the president's schedule of activities. Joan Quigley wrote in her own book that she was heavily involved in activities involving the President's international relations.